It's probably not fair, exactly, to review one's favorite author, or someone at least in the top five. I'm going to do it anyway, though, because Tobler's spot on my favorite authors list is well-deserved, and her latest entry does not disappoint, and in many ways, takes her work to new heights. I love layers, I love things which are more than they are, more than the sum of their parts, and The Honey Mummy is exactly that. 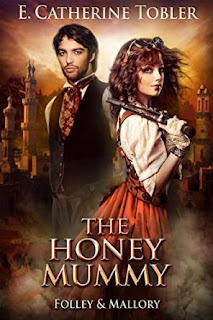 The third entry in the Folley & Mallory series (Edited to say I can't count: Book 1, Rings of Anubis, Book 2: the Glass Falcon) is complex, detailed, and moving. It is a mystery, and boy, do I love a mystery and an adventure. From the word go, it invites you to turn the page and find out what happens (and, in the case of this series, what has happened, and why). It's like Miss Fischer's meets Indiana Jones. If that's not enough, the characters, which were good enough in previous installments, but probably the weakest link, are much more fleshed out and detailed here. I cared more for Folley, Mallory (as well as the rest of the cast) more than I did previously. The romance never feels forced, but natural and right. In so many mediums romance is misplayed- characters are shoved together by the quote-unquote need for there to be romance, or they wait too long and misplay it entirely. That doesn't happen here- the romance never takes from the action or the mystery, but adds depth to it, and vice versa. Top to bottom, Tobler's writing is outstanding, and this is her best work yet. The writing is gorgeous, the characters and wonderful, the adventure is gripping. If you like anything in the vein of mystery, adventure or just plain steampunk, this is a must-read. I got nothin'. I read it in one sitting, and that says it all. Hold up, hold up, hold up, you say. That's two books in a row you gave her a nine, and this is an improvement over Falcon? Doesn't that make it a 10, Mister Engineer person, you ask? To which I reply, one would think so. But, given the quality- and the steady increase in it, and her other work, there is something to come from Tobler that is transcendent. And when I write that review, after she writes that book, I want that 10 in my back pocket. So my recommendation is to start reading her now so you can be super hipster when that day comes, and be all "I read her back when".